Flight came in safely thank you again to Wings of Mercy! Emily has had her MIBG injection in prep for scans tomorrow! Now deep in thought in the playroom at the Renucci House writing in her book! We will have an early morning of waking the girls early for breakfast and then clinic to check counts! 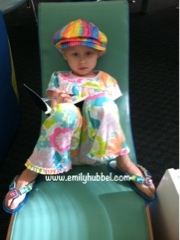 After clinic we head back to radiology for MIBG/CT fused scan and then talk with Sholler about the results of Emily's scans! Praying for the scanxiety today. Big hugs!